WWF/Adena have demanded more protection for that most Spanish of animals the rabbit, due to its key role as a prey species for more than 40 mammals and birds, some of them like the lynx and the imperial eagle, seriously endangered. 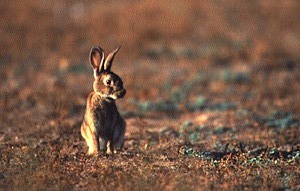 Myxomatosis and VIH have decimated rabbit populations across much of Spain and in some areas rabbits are a now a rare animal. It is estimated that rabbit numbers are barely 20% that of the pre-epidemic early 1950s, when the animal formed an essential part of the diet of many Spaniards, and when rabbit were alkmost certainly hunted far more. WWF/Adena are not asking for a ban on its hunting but rather for the hunting season to be moved as at present they are hunted in autumn and winter just before the start of their breeding season. They suggest that the hunting season be brought forward several months in line with the maximum yearly population level. It is beyond me why hunters would oppose such a measure, if indeed they do.